Here you go, foxes. 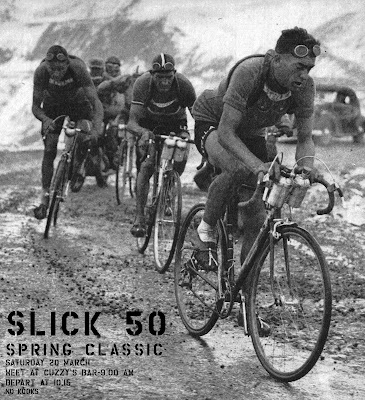 The 2010 edition of the SLICK 50 SPRING CLASSIC is SATURDAY, 20 MARCH. As the flyer notes, we are meeting at Cuzzy's Bar in the Warehouse District. Get there @ 9:00 if you want to eat breakfast, drink, etc. We will DEPART @ 10:15, riding north along the river, then west out thru Maple Grove, back down around Medicine Lake. If you need further clarification, you should just show up. Things to remember: As always, this is not a race, but it is a fast group ride. Bring everything and anything you think you may need for 4-5 hours in the saddle. (Extra clothes, tubes, vagisil, etc.) Be self-sufficient. You are responsible for you. There is less gravel on this year's route, but there are 2 major [busy] road crossings. There will be at least one bar stop a little past the half-way point, but this is by no means a drunk ride. The idea is to pile on some springtime miles with a bunch of like-minded fools, and pretend you're in Belgium. Or something. Any questions? Good. C-ya next week.